Auum Omega 3 formulations are an incredible breakthrough in bioscience and possibly the single most important action you can take to improve and sustain your health. Health Canada, the Canadian Heart and Stroke Foundation, and the Canadian Cancer Society ALL recommend an increase in dietary Omega-3. You plan your goals for the day, but do you plan your nutrition? Fats are critical but not all fats are created equal. Essential Fatty Acids (EFAs) are essential because our body does not produce them. Omegas are part of the Polyunsaturated Fatty Acids (PUFAs) unlike the Saturated and Monounsaturated fats. Omega-3 Essential Fatty Acids are a family of polyunsaturated fatty acids (PUFA’s). The outer membrane of human cells acts as a gateway allowing raw materials in and processed materials out. This outer membrane requires a constant supply of PUFA’s to remain functional. Omega-3 is an essential part of this replenishment. A shortage of Omega-3 reduces the ability of cells to efficiently perform their function, leading to nutrient starvation and chronic illnesses. Omega-3 is also converted into another class of chemical called eicosanoids, (a specific chemical/hormone group which are essential to regular healthy functioning), the most critical of which are prostaglandins. Prostaglandins are important for the regulation of inflammation, pain, swelling, blood pressure, heart function, gastrointestinal function and secretion, kidney function and fluid balance, blood clotting and platelet aggregation, allergic response, nerve transmission, steroid production and hormone synthesis. If the diet is inadequate, the Omega-3 prostaglandins produced are either lacking or unbalanced, leading to dysfunction of these vital bodily activities. “Good” fats are essential to our diet. Omega 3s are derived from three different sources, plant, fish and mammal. 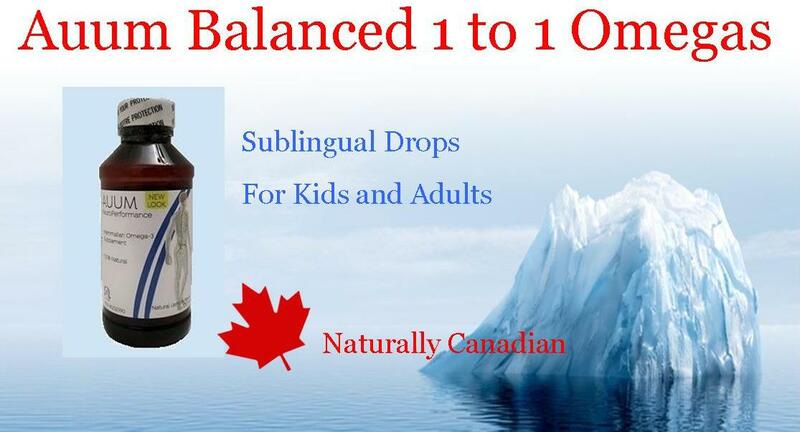 The Auum Mammalian Omega 3 oils are Health Canada approved and have been accepted for the use in double-blind studies funded by the Canadian Diabetes Association and the Canadian Cancer Society. Currently, these studies are taking place at Universities in Toronto and Montreal, Canada. Fish oils do have some Omega-3, but are out of balance with an overabundance of Omega-6 which can promote inflammation. 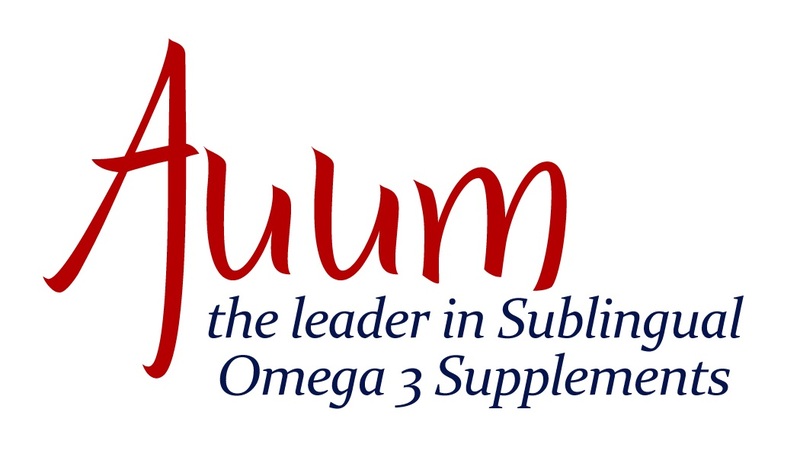 Only a “mammalian” Omega-3 like Auum has the perfect 1 to 1 Omega ratio best suited to humans. Auum Omega 3 is a “mammalian” oil from harp seal blubber. It it perfectly balanced at 1 to 1 ratio of Omega-3s and Omega-6s hence a “healing balance.” That Omega balance is what humans need for optimum health. Learn more about more differences between other omegas in the pdf brochures – English and French. Why Auum Mammalian Omega 3 is an Excellent Source of Omega-3? 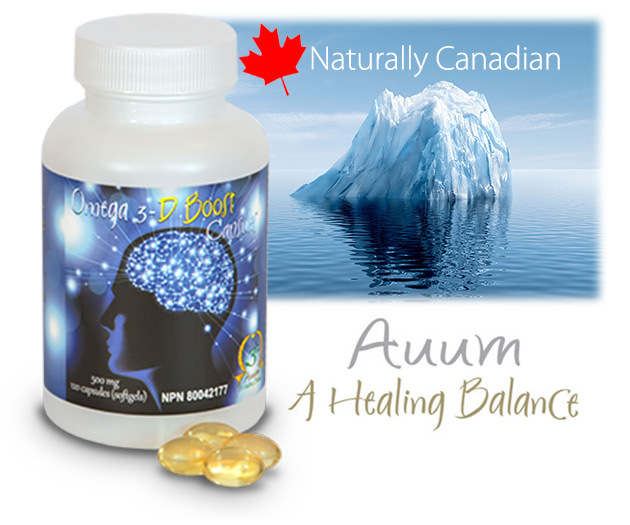 Unlike the many products now advertised as Omega-3, Auum oils are virtually identical to the Omega-3 found in human breast milk and PUFAs makes up nearly 20% of the human brain, which includes the pituitary and pineal glands. These two important glands, when studied, play a key role in many of our bodily functions. All three basic Omega-3 components EPA, DHA and DPA are present. Humans have had a chronic deficiency in DPA for generations. As a rule, this component is not present in plant or fish based Omega-3 preparations (perhaps in very trace amounts). Careful selection of raw materials and specialized processing ensures that the Auum oil formulations retain the highest possible percentage of DPA. Mammalian oil has been known to reduce symptoms and discomfort in inflammatory diseases and joint pain where as fish oils can hamper symptoms with an overabundance of Omega-6. That promotes inflammation. Omega-3 in Auum oil liquids are absorbed more fully and rapidly, than that from other sources. The buccal mucosa is a mucous membrane under the tongue and on the floor of the mouth. By making contact with this membrane, Omega-3 and dissolved Vitamin D3 diffuse into an area with a high density of blood vessels. Via osmosis, these vital nutrients quickly enter the sublingual artery, which connects to the lingual artery, then the carotid artery which connects directly to the brain. This ensures that the Omega-3 will only come in contact with the enzymes in saliva prior to entry into the bloodstream. Otherwise as much as 60% of a substance can be degraded by enzymes (monoamine oxidase) or other digestive enzymes in the gastrointestinal tract. 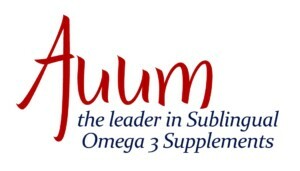 Why is the Assimilation of Omega 3 into the Body More Efficient with Auum Sublingual-D Than With Fish Oils? In humans and in all Auum mammalian Omega 3 formulations, the fatty acids (DHA, EPA, and DPA) are located primarily in the terminal positions of the triglyceride molecules, whereas in fish oil the DHA and EPA are present in the middle positions of the triglyceride molecule. The terminal positions allows for absorption sublingually unlike fish oil, and in the digestive tract. 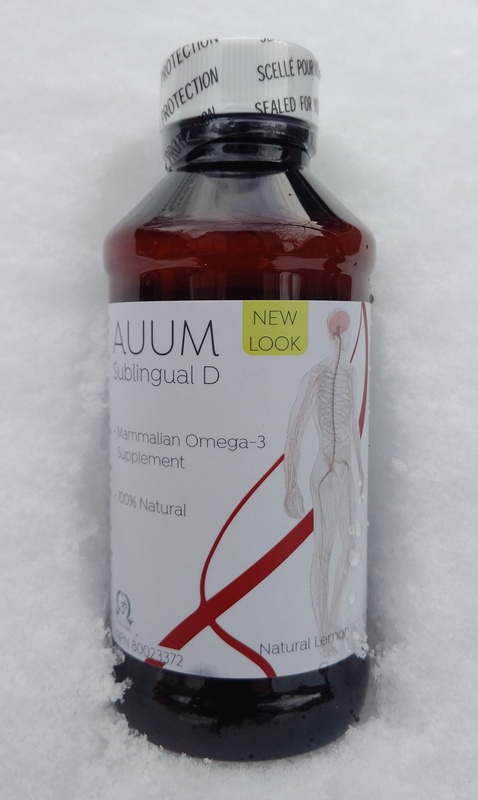 Why is Auum Omega 3 Sublingual D Fortified with Vitamin D? A recent study using data on over 4 million cancer patients from 13 different countries showed a marked difference in cancer risk between countries classified as sunny and countries classified as less–sunny for a number of different cancers. In June 2007, The Canadian Cancer Society began recommending that all adult Canadians consider taking 1,000 IU of Vitamin D during the fall and winter months (when typically the country’s northern latitude prevents sufficient sun stimulated production of Vitamin D). This kind of recommendation is a first for cancer agencies. Today’s diets are mostly processed foods. This is characteristic of many of today’s industrialized societies. We are seeing diet-based diseases increasing dramatically. About 40 years ago, health authorities recommended that western diets increase their consumption of poly-unsaturated fatty acids (PUFAs) to help lower cholesterol levels. 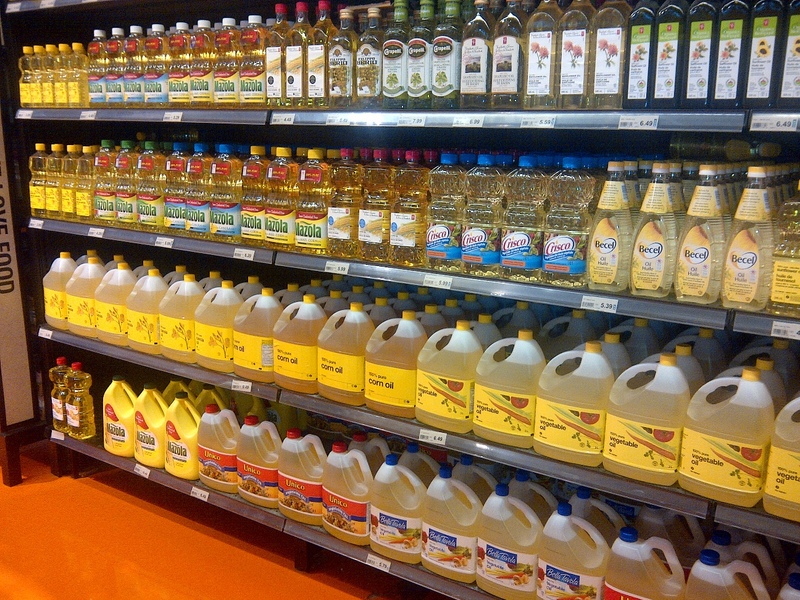 A dramatic increase then took place in the consumption of vegetable oils – rich in essential Omega-6 PUFAs, but not necessarily Omega-3 PUFAs. Fish oils naturally contain Omega-6 and Omega-3 in a ratio of at least 6:1 and often as high as 14:1. Plant seeds or vegetable seed oil such as corn even have a greater imbalance, corn oil is 60:1 Omega-6 to Omega-3 and sunflower oil is 20:1. It has now been found by that an excess of Omega-6 actually interferes with the benefits of Omega-3, thus making the existing Omega-3 shortage even more acute. It has long been established that a good diet is the prime link to good health. When Japan moved from its traditional diet of simple marine food, to the western-based diet of processed foods, their rate of disease rose dramatically. Conversely, when Norway was forced to return to its traditional diet of marine life during World War II shortages, the death rate (of heart disease, cancer, schizophrenia, etc.) dropped by 40%. This rate however returned to normal levels as soon as the war ended and the Norwegians returned to the western diet. It is of great interest that during the war the decrease in Norwegian heart disease – coincided with a 50% increase in Omega-3. Another example of the beneficial effects of a traditional marine diet (high in Omega-3) is found with the High Artic Inuit. Despite their large daily fat intakes the Inuit blood lipids remained within normal levels, their incidence of heart trouble was low and they were relatively free from Artery Hardening. Like the Norwegians and the Japanese before them, as the Inuit have adopted western diets, the occurrences of diet-based diseases have risen to the western levels. Why choose Auum Mammalian Omega 3? Our bodies neither produce nor store Omega-3 internally and must be obtained from external sources. As most of our food intake continues to be highly processed food, Omega-3 is often best obtained through supplements. Absorption is said to be 80-85 % sublingually if Auum’s liquid formulation is held under the tongue for 60 seconds or more. By holding the oil under you tongue for 60 seconds or more, the nutrients are directly, efficiently and almost immediately absorbed into our bloodstream. Liquid means increases our absorption by about 100%. Auum Omegas are bio-identical chemically to the Omegas our body requires. If we were to rely on plant or fish oils in order to obtain this essential fat, Omega-3, our bodies would need to convert the Omegas in order to effectively use it. Often we are not making the conversions either because of stress, processed foods, and poor digestive function. The good news is that if you supplement with Auum Omega 3 products, you will also notice all kinds of other good side effects as a result of providing high quality nutrition to your body in order to achieve a healthy balance. For Testimonials READ HERE. For detailed information about products Read more…. For information on how to become an Auum Client/Distributor/Reseller, please contact Cheryl Millett directly.